I looked through the deals on Groupon and found one for a cycle class that I’ve heard a lot about. I went to cycle classes in my twenties and remember them being extremely difficult and exhilarating. So I bought the Groupon, and now it’s just waiting to be redeemed. However, ladies… I am sitting this challenge out. It is not because I don’t want to exercise. And clearly it’s not because I couldn’t find a Groupon. This photo triggered me to change. Over the past couple years and for a variety of different reasons, I have been putting on weight. I had this issue before in my early twenties, so I changed my diet and started exercising and the weight melted off. For the next decade, I remained active and ate relatively well, but then something changed. I don't know if it was age, or stress, or traveling, but what worked in the past no longer worked and I found myself putting on more and more weight. This photo was taken while filming The Bobby and Damaris Show. Every morning I would show up for Hair + Makeup at 6 a.m. and walk past the in-home gym where Bobby was hitting the treadmill. Watching this trim and healthy man work hard to stay that way, I felt ashamed of my lack of discipline. Each day I would go back to the hotel and try to workout. I was uninspired and felt discouraged and defeated. At my heaviest, I weighed 183 pounds. Body image can be complex and crippling. For me it presents as a dark cloud that shadows everything. It ruins the holidays, brings panic to beach vacations, and makes me dread seeing myself on TV. When I don’t feel attractive it’s hard to get excited for costuming, or hikes in the woods, or shopping for a date night outfit. I remind myself that my worth is not attached to my weight, but when I am not exercising regularly, it is hard to be gentle with myself. And then I had one of those moments. I looked at the scale and decided to do things differently. I was going to be disciplined but loving and forgiving with myself. I started counting calories. For me this works because it helps me to find balance. I eat what I crave, but the quantity and frequency has changed. And I found a gym!!! I go to Orange Theory, three times a week. It’s a gym that monitors your heart rate as a way to determine effort-level and calories burned. 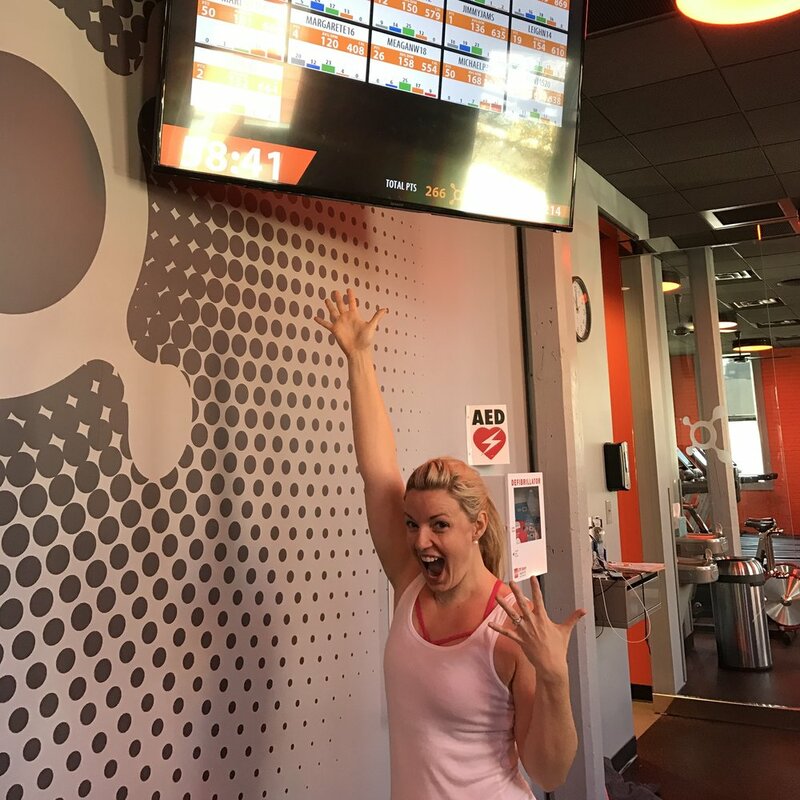 I fell in love with it and here is why: at Orange Theory I am working to build strength in my muscles and also my organs. My heart and lungs are stronger! The philosophy behind the training is to get your heart rate up, then bring it back down, over and over again, throughout the length of the class. When I started, I was very out of shape and so walking was enough to get my heart rate up. In the past, walking next to someone who was running would have shamed me into dangerously pushing my body. It would have started a cascade of negative self-talk and doubt that would inevitably cause me to self-destruct in my efforts. But this gym is different. Because I can look up at that monitor and see that I am giving it my all,—I am burning calories and I am getting strong—I feel successful and proud of myself for exactly where I am. The challenge is with me and my thought and the treadmill and NO ONE ELSE! This is a very special gift that I have never experienced in other gyms. And that is why I am sitting this week out. I am working so hard to be positive though this change and I don’t want to put myself into a situation or environment that might trigger my old habits and thoughts. I am writing this to you stronger than when I started. Stronger in my body, but also in my resolve. It might be easy to love myself if I were perfect, but I am not.